Above, Knox Street looking southeasterly from Travis in 1924. 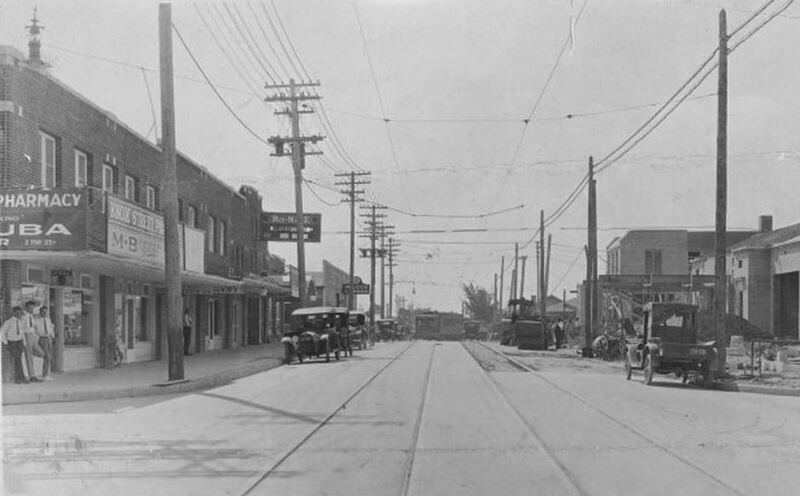 The Ro-Nile Theater (later the Knox Theater) is on the left. Today it is, I think, Pottery Barn Baby (and I think it is the original building). It directly faces what it now Weir’s Furniture. See what this view looks like today, here. 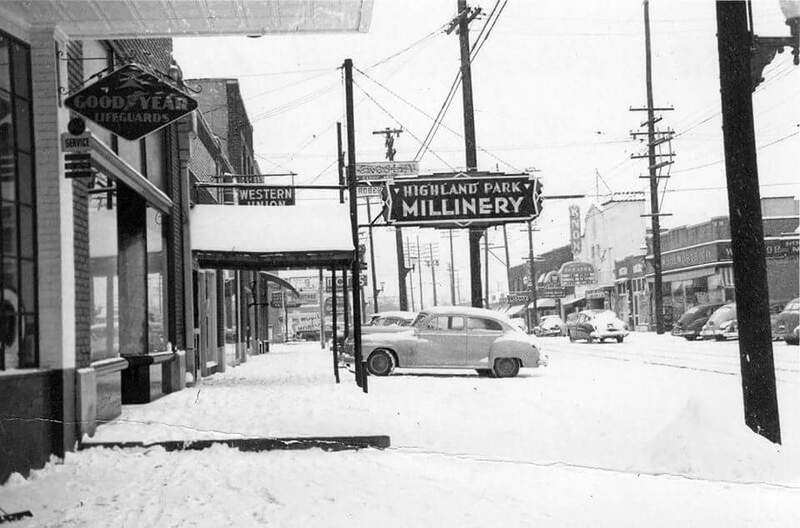 Below, a snow-covered Knox Street — around 1949 — looking northwesterly, from about Cole. The Knox Theater is on the right. See what this view looks like today, here. I used to love when Knox was charming and funky. When I drive around this area now, I’m afraid I always end up feeling claustrophobic. I remember Knox and Cole in the late 60’s when it was the Dallas version of Haight -Ashbury. There was a boutique at the End of Cole that sold hip clothing. We bought real Navy bell bottoms at the Army Navy on McKinney. I can still remember the smell of incense and petuli on weekends when the flower children gathered in front of the old theater. Sunday afternoons concerts at Lee Park and hanging out at Stone Place between Main and Elm listening to the Hare Krishna chant. Take me back…..
Dallas and hippies. Does not seem like a match made in heaven! Oh, but it was. Pockets of us were throughout the city, particularly on Knox. I never realized that Knox was hippie-central. I wonder if the Army-Navy store of the late ’60s was in the same building as fifteen years earlier. In the early ’50s the store was on the east side of McKinney not far south of Knox in a building with a good deal more architectural presence than one usually associates with Army-Navy stores; I seem to recall a lot of light-colored tile work and detailing that would have seemed up-to-date about 1923. And The Quiet Man pub on Knox was a great hang-out in the late 60’s and early 70’s. Thank you Paula. Being a writer myself I understand how important your passion for research must equal your story telling ability. You do a fantastic job with both! B.W. Stevenson was the first concert in Lee Park that I ever went to. I was fifteen, I think and my “older” girlfriend brought us some Strawberry Hill wine or something like that. Good times…great memories. We bought our Navy Peacoats at the Army Navy store down from the Texas Theatre. (yes, the place where they caught Lee Harvey Oswald). Any pictures of Granada Theater by chance? I’ve scoured the internet and couldn’t find old-school pictures. Any help would be greatly appreciated! My neighborhood movie theater growing up! I might have one or two, but as I recall, they’re not great quality. My computer is in the shop at the moment so I don’t have access to my files, but I’ll get back to you when I get my laptop back in a couple of days.